You can use all the extensions following the same pattern as in this example, only replacing the respective extension base class. For more information, see Qt Designer C++ Classes. 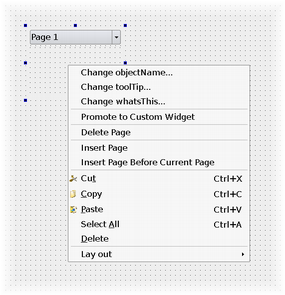 The MultiPageWidgetPlugin class inherits from both QObject and QDesignerCustomWidgetInterface. It is important to remember, when using multiple inheritance, to ensure that all the interfaces (i.e. the classes that doesn't inherit Q_OBJECT) are made known to the meta object system using the Q_INTERFACES() macro. This enables Qt Designer to use qobject_cast(QObject * object) to query for supported interfaces using nothing but a QObject pointer. Once we have the extension manager we can update the extension sheet: First we retrieve the property extension for the page which title we want to change, using the qt_extension() function. Then we retrieve the index for the page title using the QDesignerPropertySheetExtension::indexOf() function. As previously mentioned, we have chosen to use the QWidget::windowTitle property to store the page title (for more information see the MultiPageWidget class implementation). Finally, we implicitly force an update of the page's property sheet by calling the QDesignerPropertySheetExtension::setChanged() function. Remember to use the Q_PLUGIN_METADATA() macro to export the MultiPageWidgetPlugin class for use with Qt's plugin handling classes: This macro ensures that Qt Designer can access and construct the custom widget. Without this macro, there is no way for Qt Designer to use the widget.